All around the world people will celebrate the Lunar Chinese New Year on February 19th, 2015 but we will bid farewell to 甲午 (Jia Wu) a bit earlier. At 11:58 AM on February 4th, 2015 we will usher in 乙未 (Yi Wei) year. This is the year of the wood sheep. When looking ahead to 2015, Yi Wei year, what can we expect? The hexagram for Yi Wei year is 益 (Yi). Yi hexagram symbolizes “increase” and teaches us to follow the good that we see and correct the wrongs that we come across. As such, we can expect a trend towards increased moral consciousness. We should also see a rise in companies that practice corporate social responsibility. In addition, with wind (Xun trigram) over thunder (Chen trigram) we will see the more vocal outcry from the general public, however the government will be unable to illicit satisfactory change. Economically, we should see the strongest sectors in industries such as paper, lumber, agriculture, medicine, and education. In addition, since Wei is Pien Tsai to Yi expect non-traditional companies to gain economically this year. Overall, we expect central and western European economies to grow in 2015. The Russian and Japanese economies should start to see a turnaround in 2015. In North America, we should expect to see continuing economic growth and new innovations to be financially rewarded, however real estate will show a slight decline in 2015. Wood (Yi) controls earth (Wei) which, politically, shows that the government of countries that are going through civil unrest will impose more restraint on the general population. Expect more military involvement to keep the population under control. In addition, there will be uncontrolled corruption in the Middle East this year. On the world front, there looks to be increased fighting and civil unrest in Africa. There will also be issues in South American, most likely mudslides and flooding. In the Caribbean, we expect hurricane season to be difficult this year. Socially, because Yi Wei year will not see a 立春 (Li Chun), this year will not be as celebratory as last. Expect more somber moods overall. In the Pan Am games, expect Canadians and Americans to dominate the podium. For those born in rat year (1948, 1960, 1972, 1984), in general you will have more gossip around you. Relationship wise, things will not be too smooth. You have two good luck stars around you so there will be helpful people and you will be praised and treated well by superiors. For those born in the year of the ox (1949, 1961, 1973, 1985), there is a clash so you can expect some money loss or extra expenditures this year. There is also a possibility of a lawsuit. Overall, it will not be a great year. Try to keep your head down and don’t say too much, just deal with things as them come. Try to put up with issues rather than confront them or change them if you can. For those born in tiger year (1950, 1962, 1974, 1986), this will be a good year because there are helpful people around you. Your mood will be light and more upbeat in general. You will know you have good friends around you. For those born in rabbit year (1951, 1963, 1975, 1987), this will be a good year. There’s an excellent chance for promotion this year. Socially, you will be welcomed in all circles. If you face a problem, you will solve it with very little effort. The only issue will be arguments with others. Try to hold your tongue if you can. For those born in dragon year (1952, 1964, 1976, 1988), you will make money but also spend it. You will feel increased stress at work. You will feel like there is a backstabber around you, luckily your superiors or partners will stand on your side because they recognize your effort and understand your character. For those born in snake year (1953, 1965, 1977, 1989), you will show your talent this year and others will notice. If you are in business for yourself, expect a good start to the year, but there will be ups and downs later. Handle dealings with colleagues or partners with care. Mishandling issues with them can turn friends or colleagues into enemies. This year will be hard to save. You may want to take a new course to upgrade yourself this year. For those born in horse year (1954, 1966, 1978, 1990), this year will be good compared to last year. There is a chance for promotion this year. If you are in business for yourself you will start to consider expansion this year. Moneywise, things will be good. Relationships with others will be very amicable this year. For those born in sheep year (1955, 1967, 1979, 1991), this year your luck will be unsteady. Be careful with your health this year. This is a good year to plan for the future, but don’t take action this year. This year is better to stay put rather than make moves. It will be harder to find helpful people this year. For those born in monkey year (1956, 1968, 1980, 1992), you may change jobs this year. You will also have some helpful people to help with your job. Your superiors will see that you do well. The second half of the year there is a good chance for a new business partnership. If you want to get married this could be the year. If you are single you may find Mr. or Mrs. Right this year. For those born in rooster year (1957, 1969, 1981, 1993), this will not be a bad year. You will make a small profit this year. You will want to learn something different this year or upgrade your training. As long as you put in effort you will see results. Be careful of what you eat this year. If you are single you will meet Mr. or Mrs. Right this year. For those born in dog year (1958, 1970, 1982, 1994), this will not be a good year, but it will not be that bad either. As long as you concentrate and put in more effort and time you will get to the finish line. You may not get the full results you want but you will get through it. At work or home, when issues come up handle them with care or else there could be a loss of money. Make an effort to keep your temper in check this year. You will have a lucky star so things will not be as bad as you think. For those born in pig year (1959, 1971, 1983, 1995), if you are in business for yourself, business will be good but you will find the stress level to be quite high. You play a vital role at work and home so you will feel the pressure. You have lucky stars around you so things will be easier than you expect. No need to worry too much. You have charisma and others will like you which will make work life easier. There will also be helpful people to aid you. The Annual Flying Star Chart will have 3 in the center. The San Sha will move to the west. This year, the most dangerous area will be west because of the San Sha. It is important that we deal with the San Sha adequately. We provide a list of cures below that are low cost and easily procured, so please make sure that they are in place for 2015. 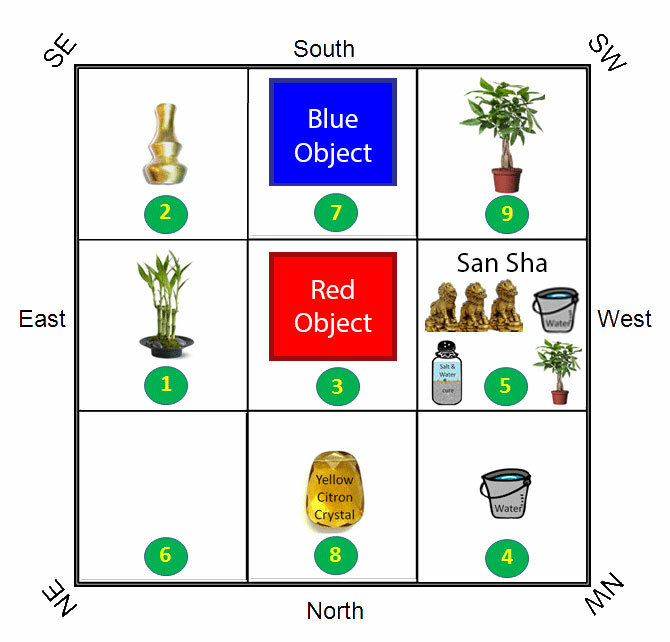 To minimize the effect of the San Sha place 3 ki luns, a small bucket of water and a live plant in the WEST. Putting 4 stalks of Chinese lucky bamboo in the EAST can enhance the possibility of career advancement, improved academic studies or heightened romance. To minimize the annual 2 black to avoid illness, simply place a metal calabash in the SOUTHEAST of the house. To minimize the annual 3 jade-green to avoid arguments and being emotional, put something red in the CENTER. Put a glass of water in the NORTHWEST for the possibility of career advancement, improved academic studies or heightened romance. To combat the 5 yellow place the salt-water and coins cure in the WEST of your home. Place something blue in the SOUTH to lessen the effect of the annual 7. The NORTH will be the best sector in 2015. Simply put a citron crystal there for a better year financially. Put a plant in the SOUTHWEST to bring about events for celebration. Need help placing the cures for 2014? Want a personalized month-by-month bazi reading for 2015? Click here to learn more.